but you still hang at T.G.I. Friday's at 112 Katong. Expire on 30 June 2012. 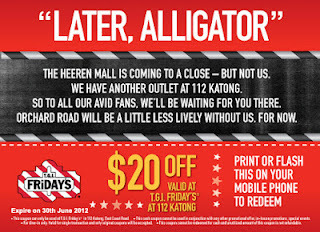 Valid only at T.G.I. Friday's at 112 Katong outle. This coupon cannot be use together with other promotional offer, in-house promotion, special event. For dine-in only, valid for single transaction and original coupons will be accepted. This coupon cannot redeemed for cash and amount of this coupon is not refundable.